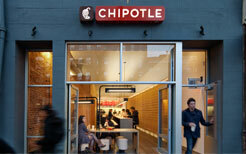 Chipotle Mexican Grill, Inc. and its subsidiaries (“Chipotle”, the “Company”, or “we”) operate Chipotle Mexican Grill restaurants, which serve a focused menu of burritos, tacos, burrito bowls and salads, made using fresh ingredients. 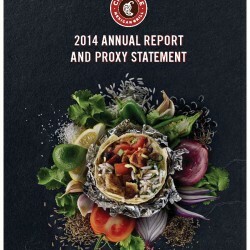 As of December 31, 2014, Chipotle operated 1,755 Chipotle restaurants throughout the United States, as well as seven in Canada, six in England, three in France, and one in Germany. Additionally, Chipotle restaurants include nine ShopHouse Southeast Asian Kitchen restaurants, serving Asian-inspired cuisine, and the company is an investor in a consolidated entity that owns and operates two Pizzeria Locale restaurants, a fast casual pizza concept, resulting in a total of 1,783 restaurants as of December 31, 2014. The company focus on trying to find the highest quality ingredients they can to make great tasting food; on building a special people culture that is centered on creating a team of top performers empowered to achieve high standards; on building restaurants that are operationally efficient and aesthetically pleasing; and on doing all of this with increasing awareness and respect for the environment. Chipotle have grown substantially over the past five years, and expects to open between 190 and 205 additional restaurants in 2015, including a small number of ShopHouse and Pizzeria Locale restaurants. Chipotle’s vision is to change the way people think about and eat fast food. The company do this by avoiding a formulaic approach when creating their restaurant experience, looking to fine-dining restaurants for inspiration. Chipotle use high-quality raw ingredients, classic cooking methods and a distinctive interior design and have friendly people to take care of each customer — features that are more frequently found in the world of fine dining. The company approach is also guided by their belief in an idea they call “Food With Integrity.” Their objective is to find the highest quality ingredients they can — ingredients that are grown or raised with respect for the environment, animals and people who grow or raise the food.